Here, we are going to learn how to find the level in a binary tree with given sum K – its an interview coding problem came in Samsung, Microsoft? The article describes how to find the level in a binary tree with given sum K? This is an interview coding problem came in Samsung, Microsoft. Given a binary tree and an integer K, output the level no of the tree which sums to K. Assume root level is level 0. 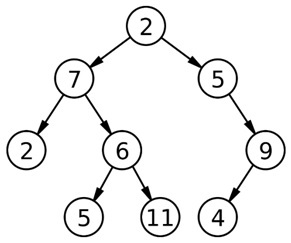 One of the popular traversal techniques to solve this kind of problems is level order tree traversal (Read more: Level Order Traversal on a Binary Tree) where we use the concept of BFS with some modifications. 1. Set a variable level=0 & declare a variable of type tree* named temp. level is a flag for the current level & temp stores tree node to be processed. Every time, we EnQueue a NULL to reflect the end of current level. Same way while processing when NULL is found, it reveals that end of current level.